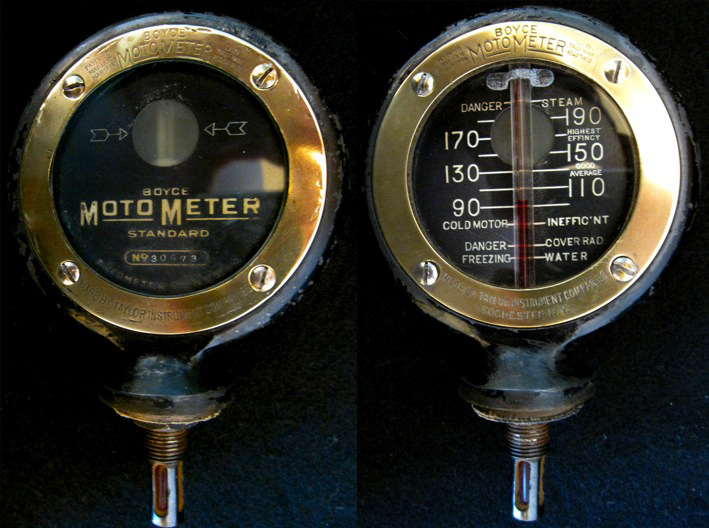 Automobile radiator-mounted engine temperature indicating gauges – “Know the Heat of Your Motor” How they got started and evolved. 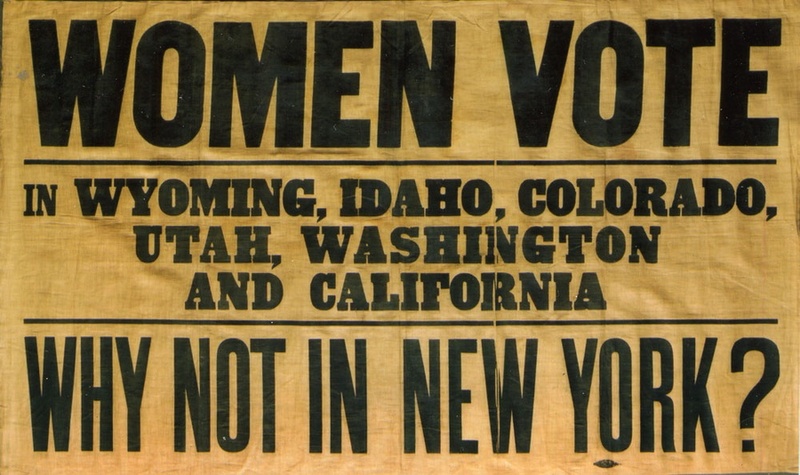 this exhibit presents the history of the struggle for women’s suffrage rights in the Unites States. 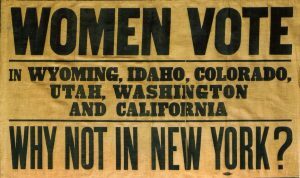 Artifacts, Textiles and a plethora of images follow a time line that dates the struggle for women’s rights back to founding of our country. 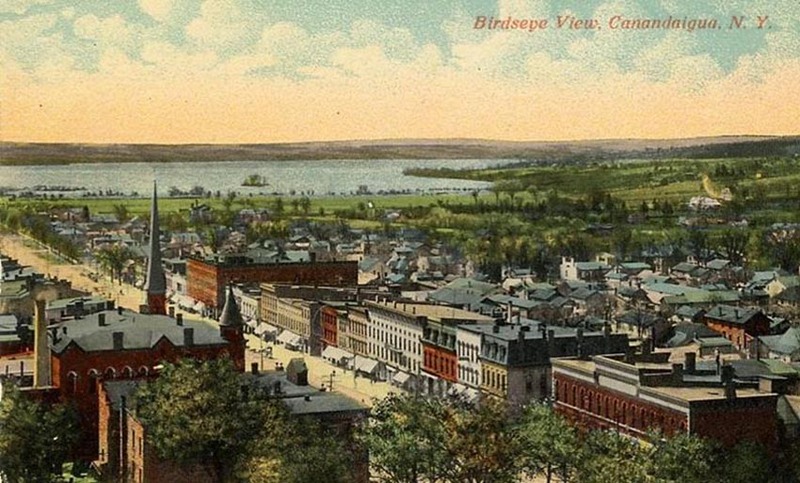 Based on a remarkable 1964 aerial picture found at the Canandaigua Daily Messenger, “1964” showed the city’s incredible transformation to the present with a tragic and unbelievable 50 plus buildings missing since that picture was taken. Visitors saw that now famous picture showing all the missing buildings side by side with a 2017 drone replication. It wouldn’t be “1964” without those cultural features of the time. 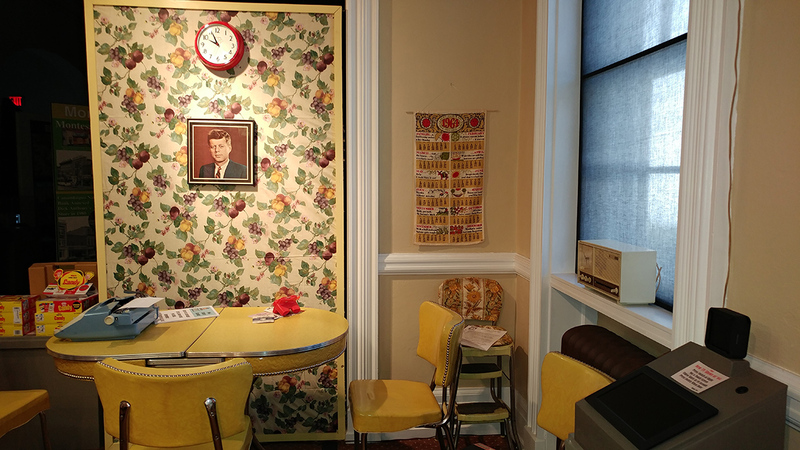 You could sit down in the early 60’s mini-kitchen and read 1964 Life, Look and Post magazines at the table. Or watch 7 different 1964 videos including a Wilmer and the Dukes /Arrowhead Lanes tribute, 1964 car and toy commercials, 1964 Johnson/Goldwater Political ads, Cigarette commercials that will astound your kids and grandkids, the #1 hit tunes of 64 and more. With the first successful flight of the Wright Brothers in 1903, the era of modern aviation began. 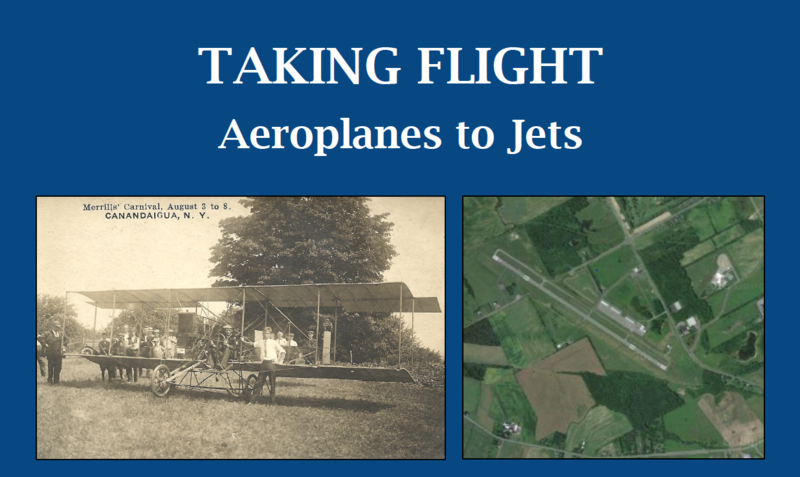 Within ten years, flying grew in popularity in the Finger Lakes beginning with Glenn Curtiss’ flight of his “June Bug”, to local barnstormers, to pilots in the world wars and other military conflicts, to the growth of local airstrips and the establishment of the Canandaigua Airport. 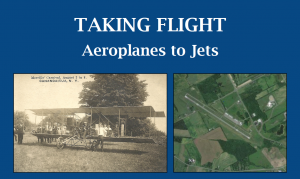 By the turn of the 21st century, Ontario County was readily accessible by air both locally and regionally. 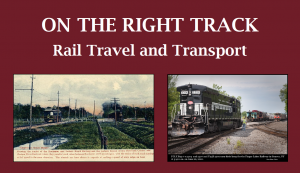 At the beginning of the 20th century, railroads were one of the primary modes of transportation throughout the country, connecting the smallest towns with the largest cities. In 1916 there were over 250,000 miles of rails. Railroads hauled 98 percent of the intercity passenger traffic and 77 percent of intercity freight traffic. With the start of World War I, railroads met with overwhelming increases in demand for freight and passenger service. To keep traffic flowing for the war effort the federal government took over the industry from 1917 to 1920. Later, railroads met with increased competition from other forms of transportation. Millions of cars, trucks and buses were on the roads, highways were improving, and planes were more reliable. During the Depression, many railroad companies went bankrupt or were bought by stronger companies. While railroads were jammed with traffic during World War II, after 1945 passenger and freight traffic began to drop quickly and did not recover. The railroad industry declined rapidly, eventually resulting in the formation of Conrail and Amtrak in 1971. 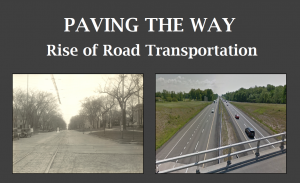 During the 20th century Ontario County roads were transformed from rutted dirt tracks to paved highways and secondary roads connecting its cities, towns, and villages with the rest of the state and nation. 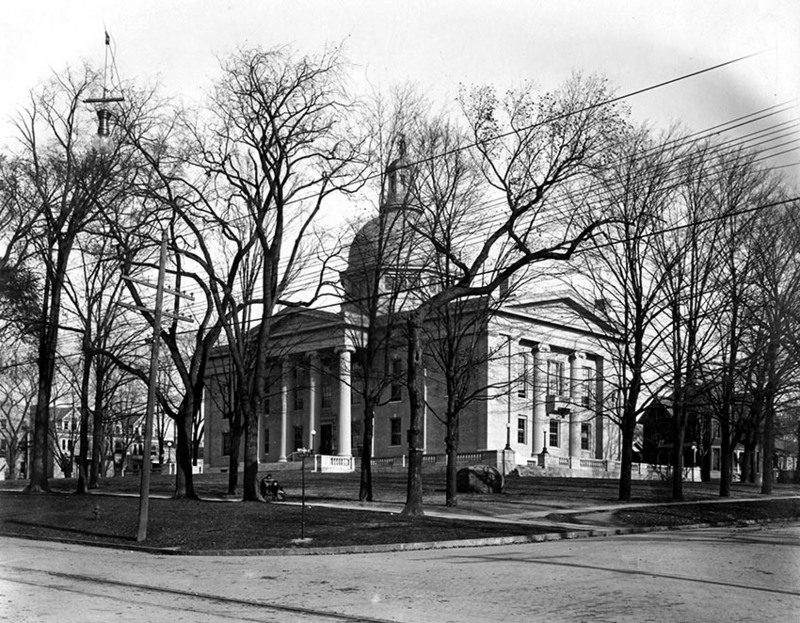 The Good Roads Movement of the early 1900s successfully advocated for better roadways using political change to increase state and local funding. In the post-World War II era, New York State became one of the first states to develop and construction a superhighway – the Thruway – across the entire state. Later in the 20th century, new road construction created bypasses and wider roadways to ease traffic congestion and improve road safety. This age-old question motivated people in New York to develop and utilize transportation systems from footpaths, rivers, and roads, to canals and railroads. In the 19th century, these systems moved settlers and travelers, raw materials, agricultural and manufactured products from farms and villages to cities across the region and country. 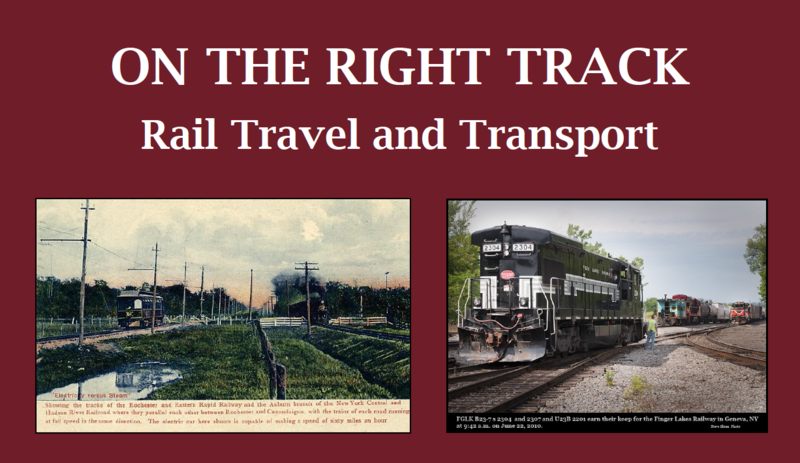 Transportation links helped create regional economies, and impacted land use and development of the Ontario County region from 1790 to 1900. A wedding is a universal rite of passage steeped in tradition, ceremony, and symbolism. 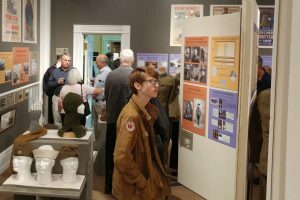 This exhibit explored Ontario County weddings from 1790 to 1990 as reflected in the special gowns, outfits, accessories, photographs and life stories preserved to remember this special, life-changing event. 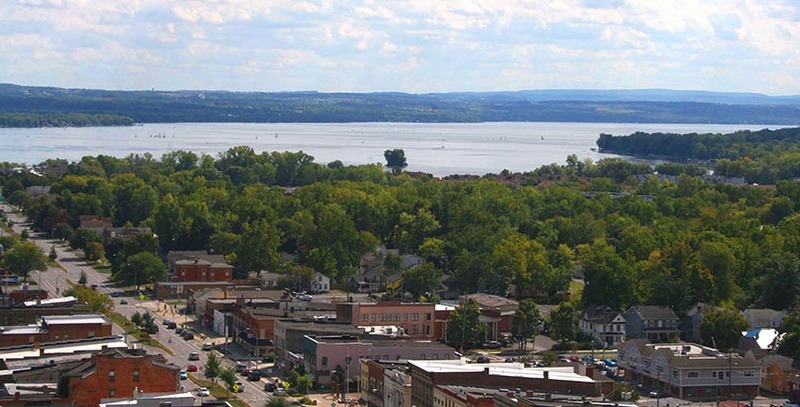 Over the past one hundred years, the city of Canandaigua has faced many challenges and opportunities brought on by social, economic and political changes. Government restructuring, immigration, women’s suffrage, prohibition, world wars, economic busts and booms, urban renewal and historic preservation all have impacted the community. 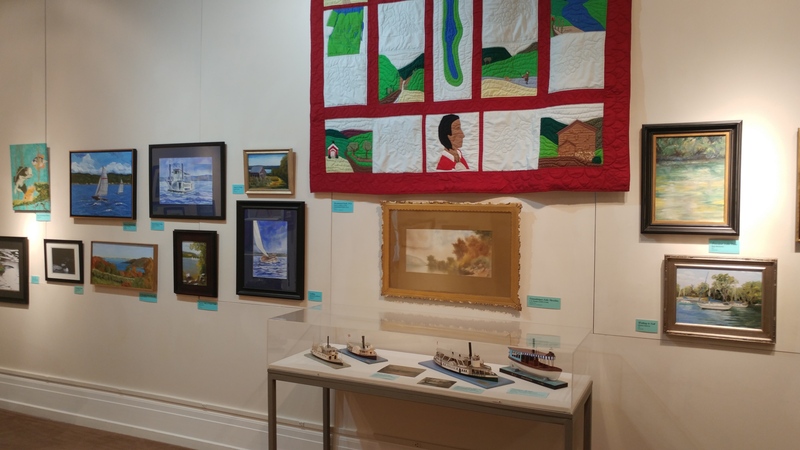 This exhibit explored the many changes to life in this small city reflecting on why Canandaigua remains the “Chosen Spot” to live. Please go to our bookstore for books related to this exhibit. Many visitors ask this very question. In this exhibit we hope to answer that by displaying selected artifacts and explaining what and why we collect and how we care for them. What will you see in the exhibit? 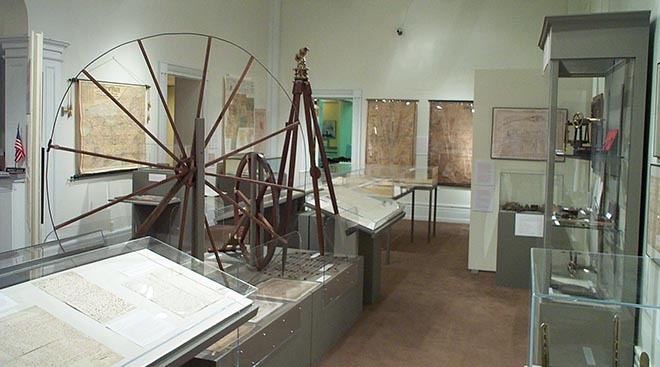 You’ll see a selection of historic artifacts made, owned or used in Ontario County. This includes building parts, furniture, household items, jewelry, clothing, agricultural implements, guns and swords, medical equipment, vacuum cleaners, phonographs, cameras, milk bottles, baskets, ceremonial items, artwork, games, toys, and Native American items. How many items are in the exhibit? There are about 700 items on view. This represents less than 10% of our entire 3-dimensional exhibit. The rest is in storage in this building. 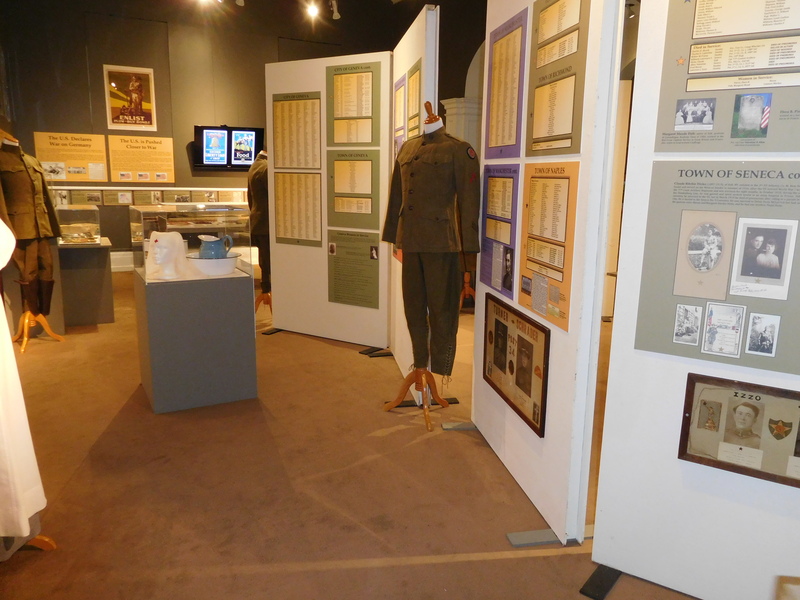 How are the items organized in the exhibit? All items are grouped by similar function and type using a standardized museum nomenclature (naming) system. You’ll see categories with basic definitions as you go through the exhibit. What won’t you see in the exhibit? Photos, letters, manuscripts, books, maps – anything flat – will not be included. There just isn’t enough room for them! 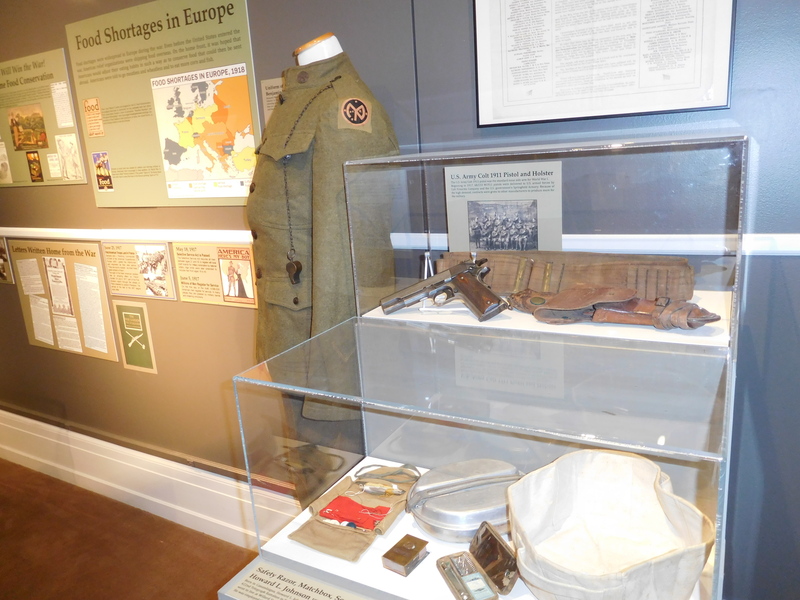 If you would like to find out more about these types of items please visit our Research Room. What do baseball and the railroads have in common? In the village of Manchester, like in many railroad towns across this country, the railroad yards were the place where men got together to play America’s favorite pastime. 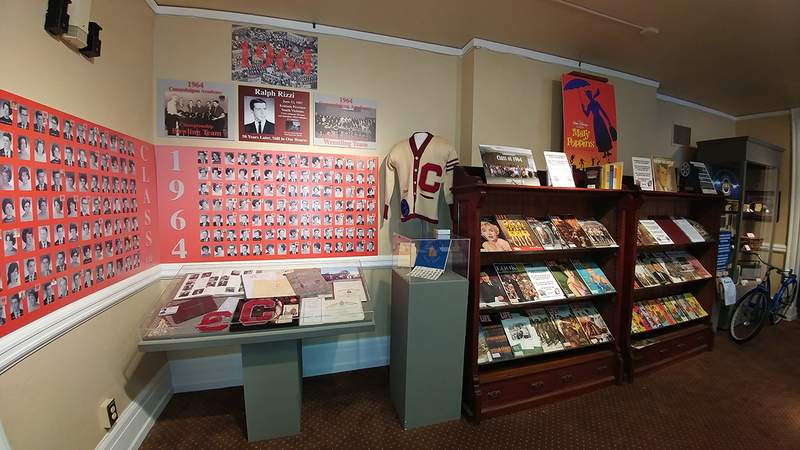 This exhibit brings to life turn-of-the-century, semi-professional baseball. See dozens of photographs, 3-D sculptures and life size paintings of the men and women who played baseball in this small Ontario County village. This exhibition was developed by Manchester’s own Tim Munn and Randy Darrow. What does being “self made” mean? 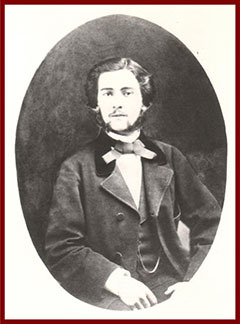 To most it is the Horatio Alger story of going from rags to riches. However, in Lincoln’s time, being self made also meant to improve oneself through good morals, character, lifelong learning so that he/she could be a better citizen. In doing so a person might bring wealth to him/herself and family, but also might contribute social, intellectual and material improvements to the community and society in general. 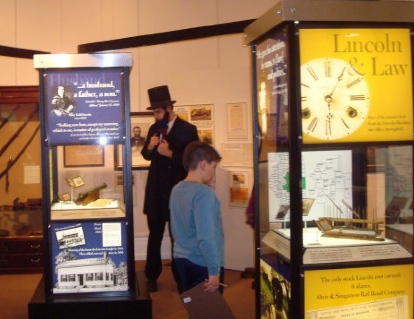 The Museum was proud to host this national traveling exhibit, developed by the Abraham Lincoln Presidential Library Foundation in Springfield, Illinois. 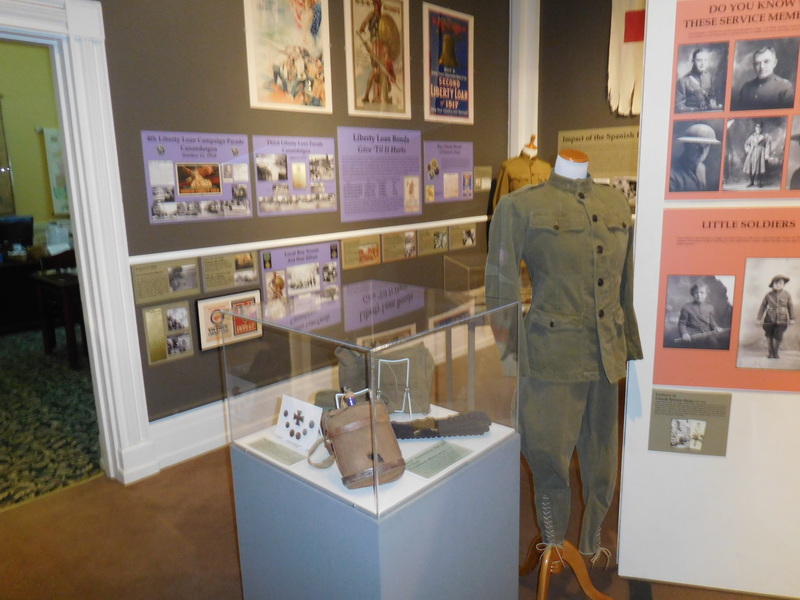 Our museum was the only venue in Western New York to host the exhibit. 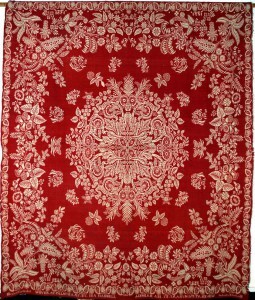 This exhibit features over twenty-five bed coverings made between 1800 and 1930 from the OCHS collection. Not only did these quilts and coverlets keep people warm they reflect the skills, artistic creativity and practicality of the makers. Quilts were one of the more common bed coverings and were most often made by women. 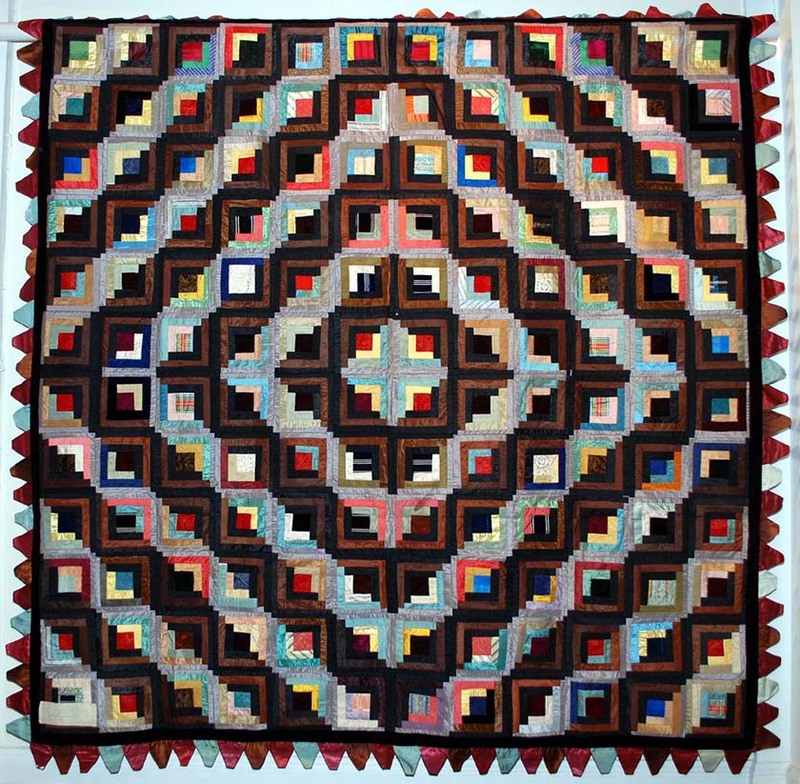 Quilts are made up of three layers: a top that is often pieced to create patterns, the middle layer of cotton batting or a woven blanket, and a bottom of plain fabric. The three layers are hand stitched together in an all-over design. 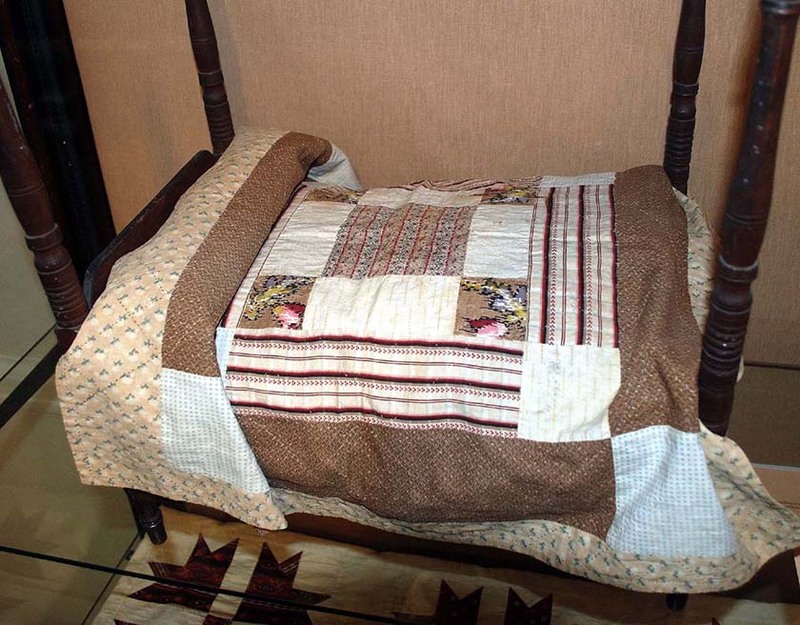 Most quilts were made with cotton fabrics, although during the late 19th century Victorian women experimented with silks making what are known as “crazy” quilts. Coverlets were blankets made from wool and cotton yarn woven into a variety of designs and were most popular in the mid-19th century. 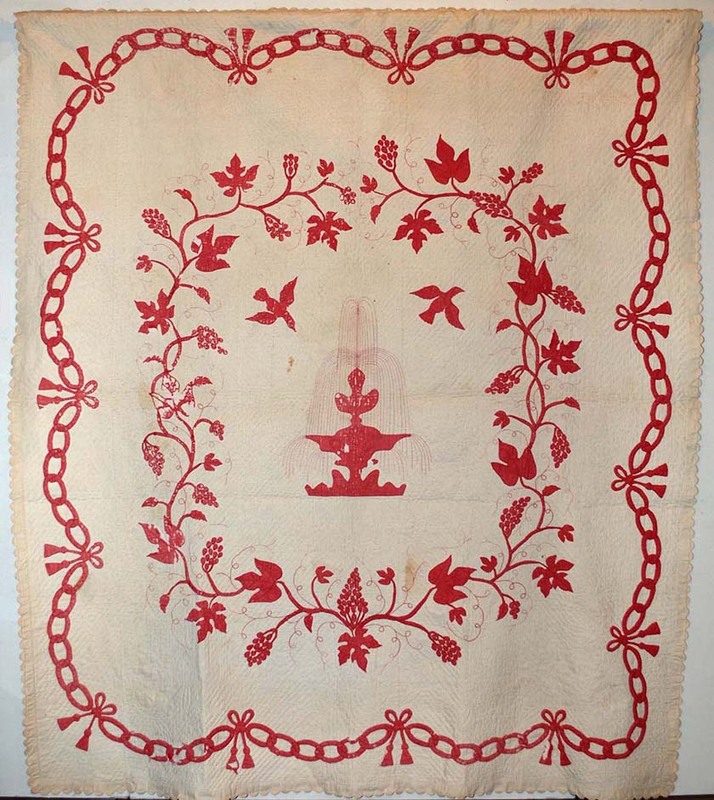 Coverlets with simple geometric designs were often woven on looms in the home by women or men. Those with fancy, figured designs which often included national symbols such as eagles or stylized floral designs were woven on large looms with “Jacquard” punch card attachments used to make the patterns. 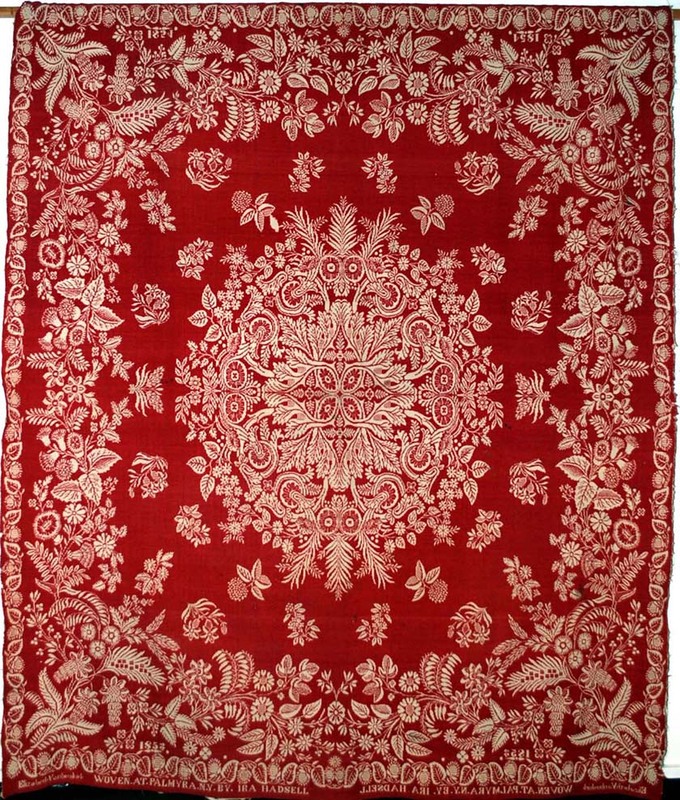 These coverlets were most often made by men who were professional weavers situated in larger communities. Bedspreads were lightweight covers placed over bed linens and blankets to keep bedding clean and give a bed a finished appearance. 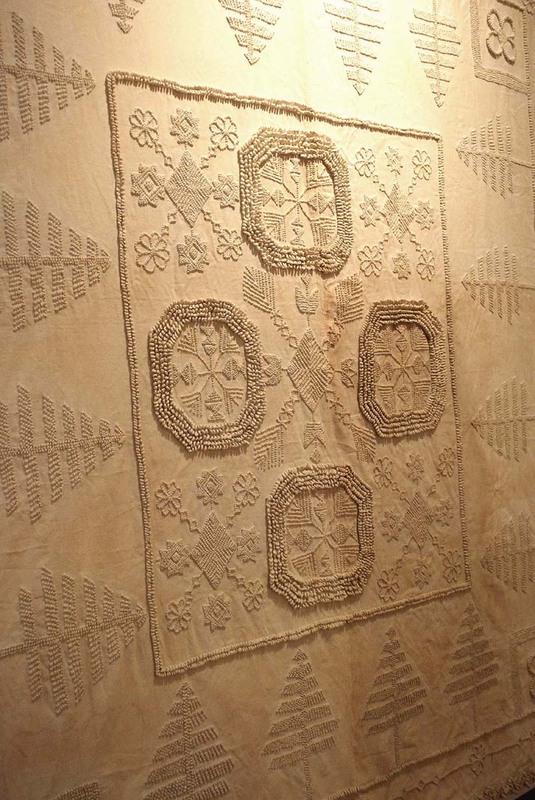 The three candlewick bedspreads on display were made in the early 19th century and feature a variety of geometric designs, national symbols, and designs from nature. Candlewick patterns are created using a heavy white cotton yarn, like that used for the wicks of candles that is stitched and looped into designs on white cotton fabric. Nearly all of the bed coverings were made locally or were brought here by families who settled in the region. A catalog for the exhibit is available in our bookstore. “Mapping Ontario County” explores how Western New York was first surveyed and mapped for settlers moving from New England and the Mid-Atlantic to the area. 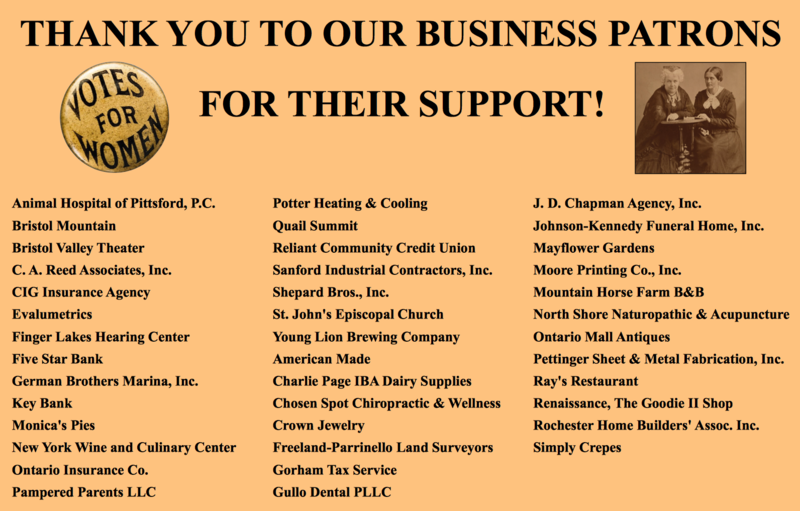 What was the Phelps and Gorham Purchase? What were the first surveys and how were these accomplished? Who were the surveyors? What was the Pre-emption Line? How and when did other counties break off from the original Ontario County? 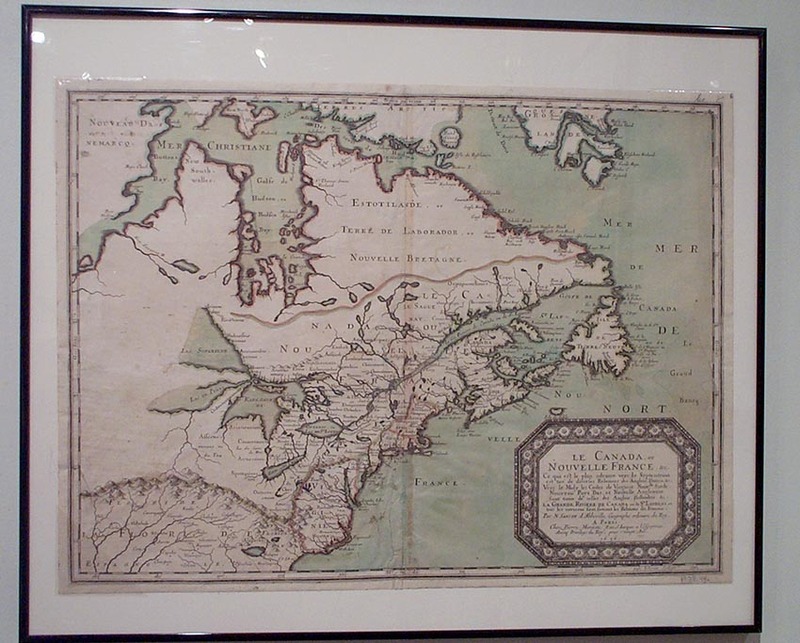 What and how were maps developed and used in the later 19th century? 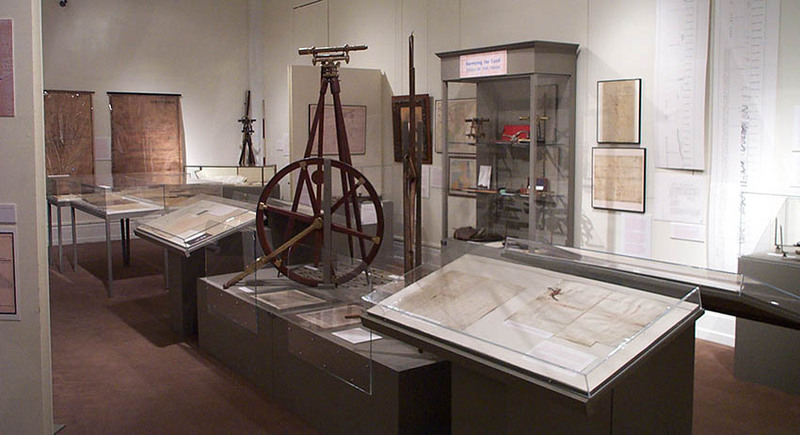 Many of the oldest maps in our collection as well as some early surveying equipment are on display. Although today’s society often appears to be rife with crime, little has changed since the 1800s when it comes to human nature. Western New York was no exception. Crimes of passion, drunkenness, murder, greed, power, control, indebtedness, bootlegging occurred frequently and made the headlines of many local newspapers. 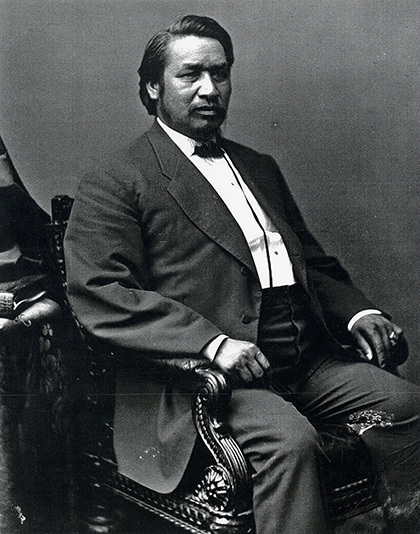 Sheriffs were elected and court systems were set up quickly following pioneer settlement to protect communities and to serve justice with equity. In this exhibit we feature selected stories of crime as well as look at the types of punishment meted out. Theft and Robbery: Theft of goods and property began as soon as people came to settle in Western New York. 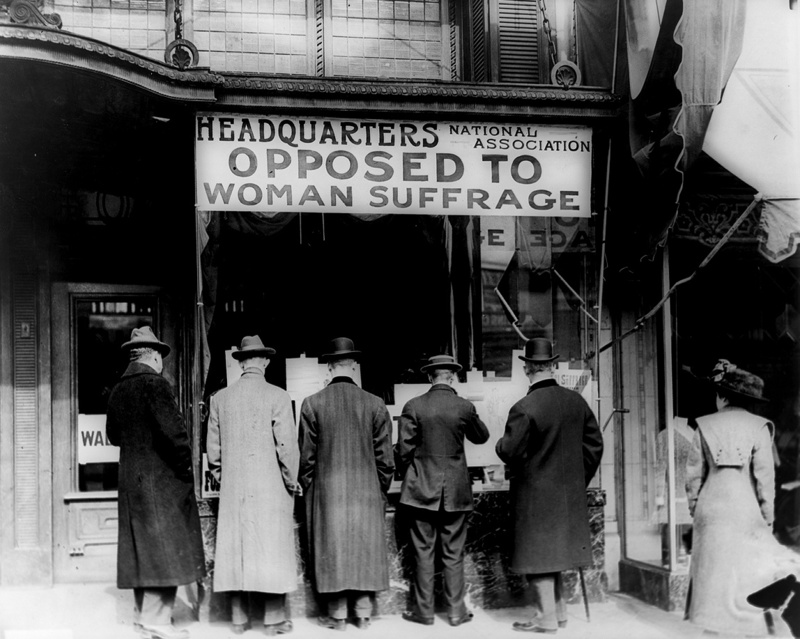 However, the legal system was established very quickly to accommodate those who sought to take advantage of others. 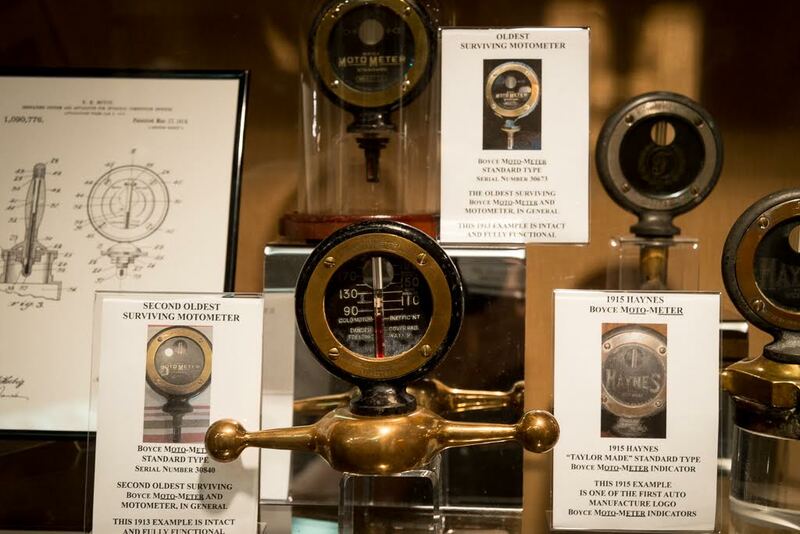 From Temperance to Prohibition: The temperance movement began in the early 19th century spearheaded by physicians, ministers and employers concerned about the drunkenness of workers and servants. It eventually became one of several social reform movements led by the middle class. 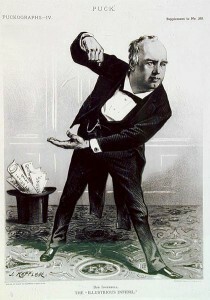 The Crime of Debt: In the early 19th century failure to pay one’s debts could land the debtor in jail. What would the current financial community think of the use of debtor’s prison in the 21st century? Murder!! 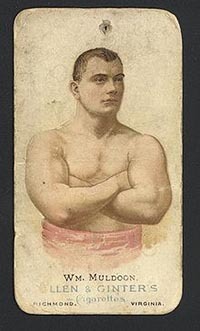 : Like today, 19th century passion, drunkenness, greed, and the desire for power sometimes led to the crime of murder. In the late 1800s, the punishment for murder in the first degree was death by hanging: two men were hanged in Ontario County, one in Wayne County, and several in Monroe County. 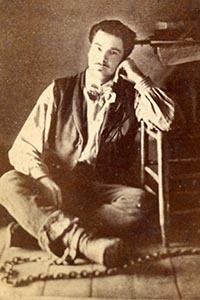 During the 19th century, individuals with mental health problems, physical disabilities, and mental disabilities were often placed in jail or in institutions as their families were unable or unwilling to care for them, or they had no means of support. 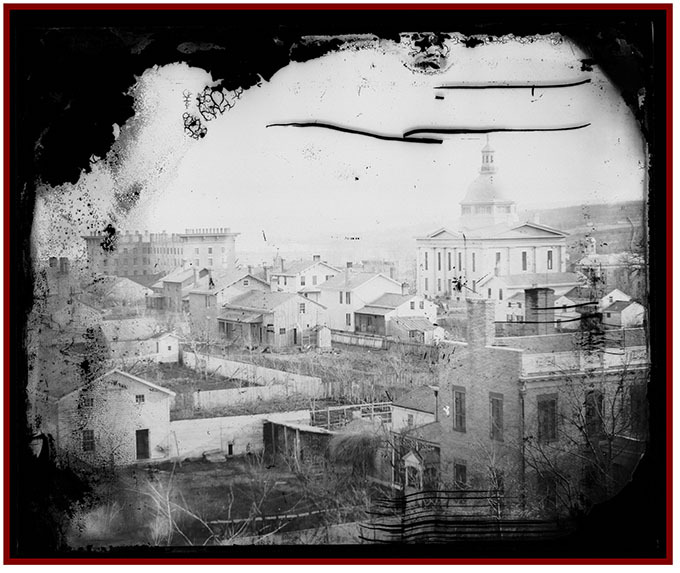 Such individuals were housed in the county jail or the poorhouse until state reforms began. 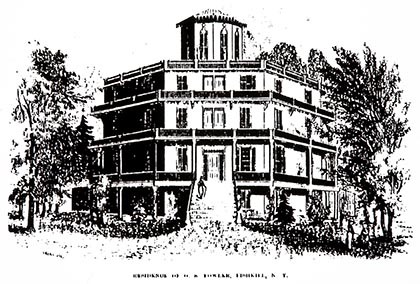 Shortly after Ontario County was founded in 1789, the first county jail was erected – a log structure. 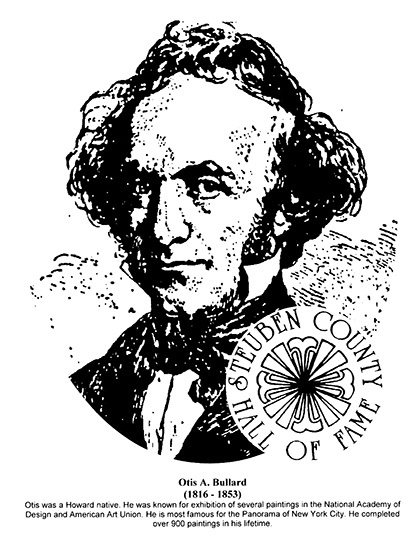 By 1815, the County allotted $6000 to construct a permanent jail – a substantial fieldstone structure. 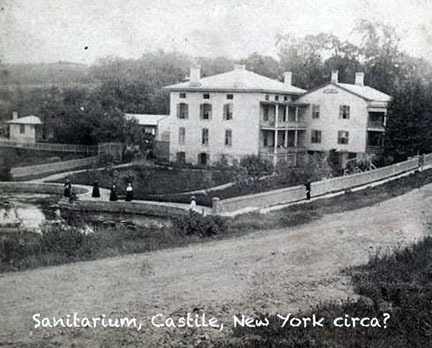 In 1895, a new larger jail was constructed next to the old one for nearly $25,000. 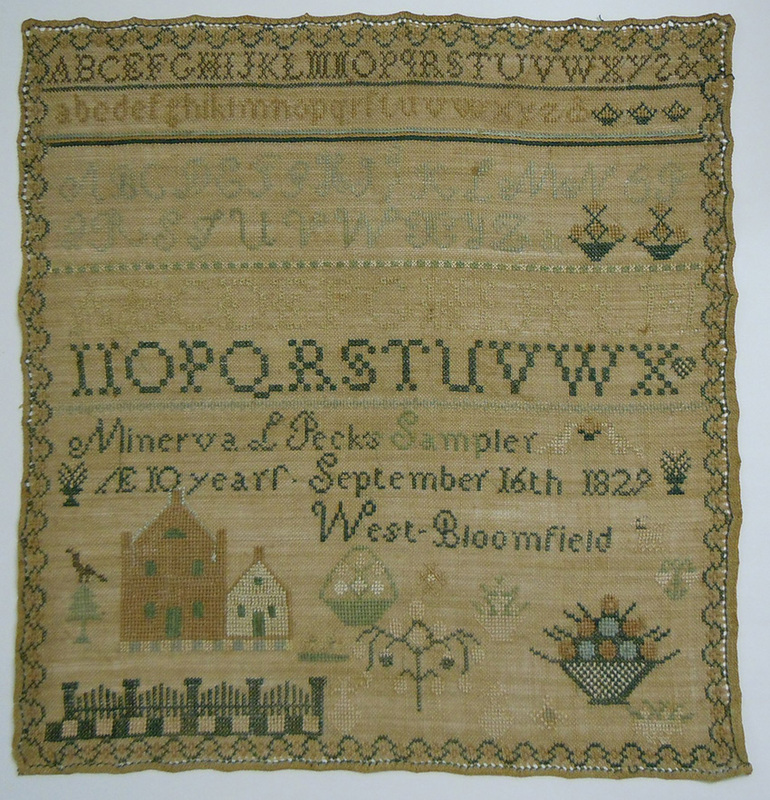 The most common makers of needlework samplers were young girls and women during the 18th and 19th centuries. Great effort has been made to conduct research beyond simply the name and birth date of the makers of the samplers. Who were the makers of these samplers? What kinds of family were they from – their socio-economic status, cultural origins? Where did the maker live when the sampler was made? Did the maker learn her (and sometimes his) skill at home or in a school? Why did the maker create the sampler? Each sampler in this study has been evaluated as to how it was made. What types of fabrics were used? What was the thread count and thread thickness of the fabric? How do these fabrics differ from today’s needlework fabric? What types of floss materials were used – silk, wool, cotton? 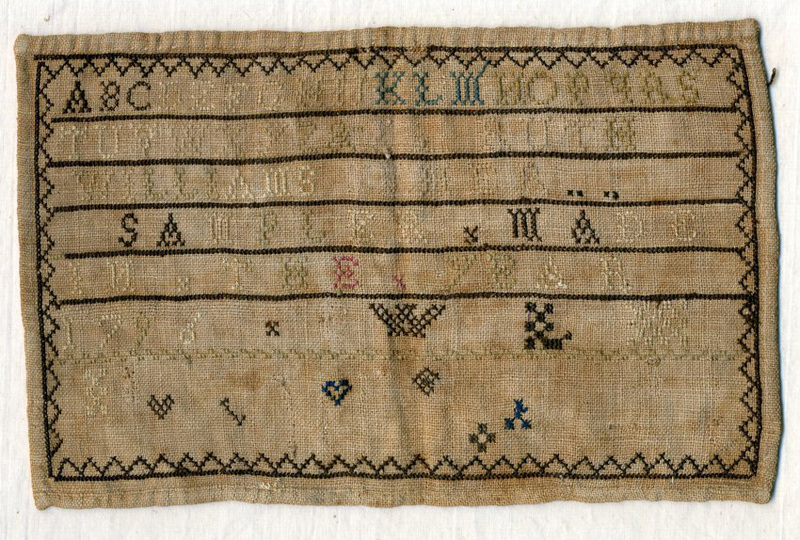 What variety of stitches and motifs were used on these samplers? What colors were most common? 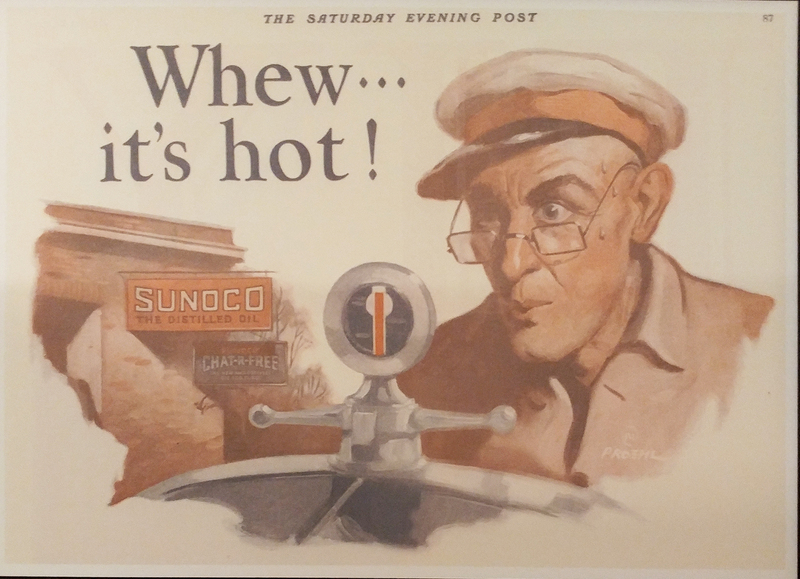 This exhibit includes seventy samplers from several areas and time periods. 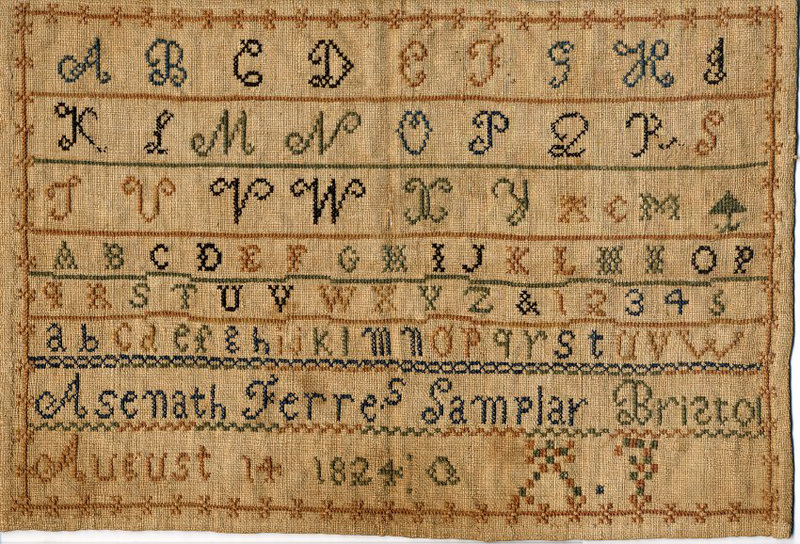 Many of the samplers were borrowed from other historical societies and private individuals. Selected samplers from the OCHS collection have been charted and reproduced to compare with the originals. To purchase copies of the charts please go to our bookstore.